Robert Kelsey’s What’s Stopping You? has become a self-help classic. His What’s Stopping You? books have helped thousands of people worldwide overcome their limiting beliefs and bash through their barriers to success. Now Robert is back to help us defeat the obstacles that stop us achieving more in our everyday lives. Many of us have the greatest of intentions but find ourselves procrastinating, which results in low attainment and frustrated ambitions. Grounded in solid psychological research Robert helps us examine why we might have these tendencies and how to overcome them in order to feel more together, in control and on-top of everything. 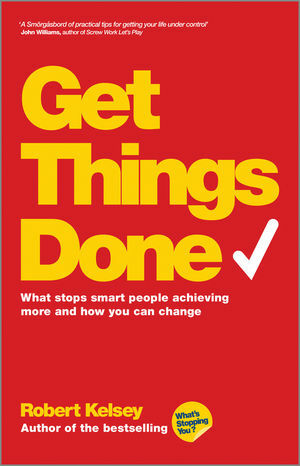 Get Things Done is emotional ergonomics for the organisationally-challenged individual – at home, at work, with themselves, and with others.